I have heard this sentence hundred thousand times. At least. I have probably said or thought this sentence hundred thousand times myself. Because it’s easier to start Monday, right? I have got SOOO much on this weekend, it’s impossible to start a diet/healthy lifestyle/good habit (choose your favourite) today. It will have to be Monday. Monday is a better day. Fresh start. I don’t have anything on on Monday. Not Tuesday either, so Monday will be good. 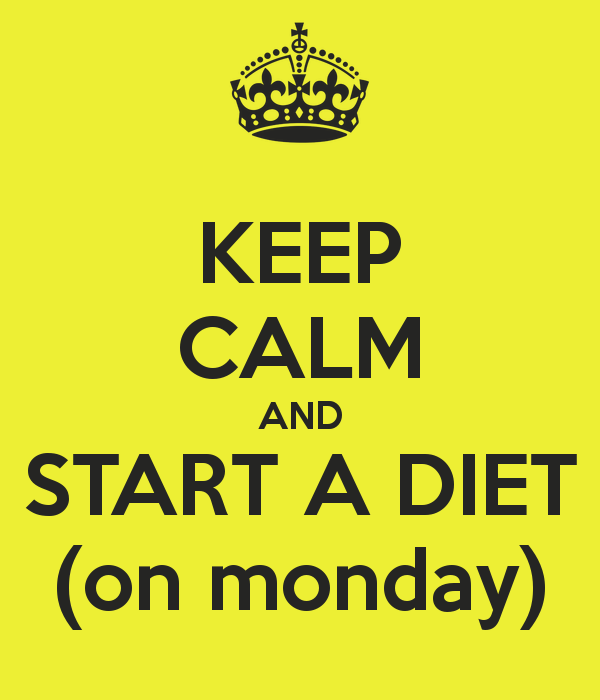 I will start Monday. I promise. Let me tell you a secret; You will have something on next weekend. And then there is that wedding coming up. Oh, and the weekend away you have been planning for six months. Then it’s your daughter’s 3rd birthday (gonna have to try the cakes before serving them!!). After that it’s your birthday and then suddenly bikini season is upon you and the Mondays came and went. You probably started a few Mondays, but then something happened, you slipped, fell off the horse and felt like the whole world was crashing down and everything was ruined, so better just wait until next Monday to start over again. 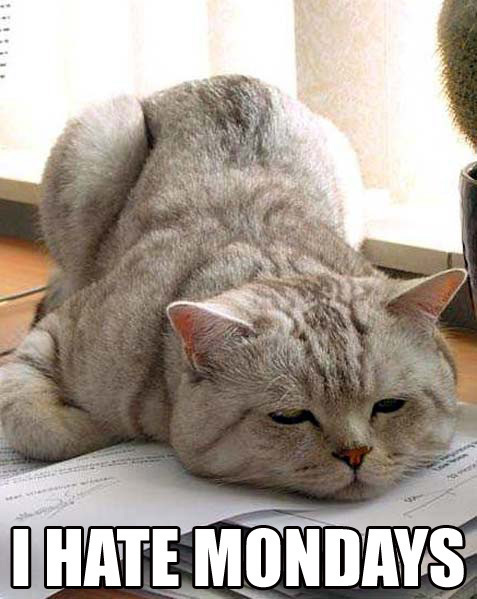 What is it about Mondays that is so good? 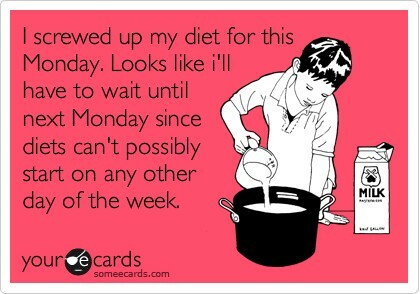 Why does all new and healthy habits have to start on a Monday? I don’t get it. If you plan on changing your life on a Monday, take all your bad habits out and replace them with fantastic, healthy habits all in one day, you are setting yourself up for failure. Especially on a Monday. Many people I know, don’t even like Mondays for starters and they choose to make them into that sad day when they will never eat sugar again, they will get up at 5AM every morning to exercise and they will only have salad for lunch. Picture yourself after a great weekend. You had a lovely three course dinner on Friday night (and probably a bottle of wine by the end of the night). On Saturday you had lunch with a girlfriend (the muffin you had afterwards just looked too good not to have!!). Then your significant other surprised you with homemade dinner with dessert (can’t say no when he has finally cooked, right?). Sunday lunch with the family and your favourite TV show Sunday night with a last little treat before your new life starts on Monday morning! 15 minutes later you are enjoying your tasty pizza, thinking to yourself “Oh well, I’ll just start Monday. I have so much on this week anyway, it will be impossible to do it this week.” Tuesday morning you drag yourself out of bed, have a shower and go straight to work, with a nice big latte in your hand, have your usual toasted sandwich with chips for lunch and a sneaky chocolate bar at 3 o’clock with your third latte for the day, thinking that Monday will be good. I’ll start Monday. Promise! Does this sound somehow like you? I have a really good idea! One thing at the time. Baby steps. One bad habit at a time. Today, Thursday, is a great day to make one good choice for a healthier lifestyle. Pick one thing! Not two or three. One! Stick to that one thing for three weeks. If you forget one day, keep going the next day. Don’t wait until Monday. Then after about three weeks, when this new healthy things is starting to become a habit and doesn’t feel that strange anymore, pick one new thing. One, not two! And all these small things will add up in the long run. This entry was posted in Food, Interesting Things About Food (Mostly), Move More, Something Every Day and tagged Exercise, Food, health, Healthy, healthy-living, I'll start Monday, Lifestyle, Monday, Obesity, Something Every Day. Bookmark the permalink. Yes, I agree. You need to find what works for you and not put it off until tomorrow! Because there will always be another tomorrow you can put it off until! Did you read my mind ?? But this week i’ve started on a saturday, breaking the pattern!! Hahaha, that is SO TRUE! And the sad part is, I’m always convinced that the upcoming Monday will really be a big turning point. I like the I certainly have to stop putting things off until ‘tomorrow’….Thanks for this post! LOL. Which is sooooOo true! Love your posts. Keep writing! Sounds like a good plan. Start today and do something every day. In a year you will be very happy that you started today 🙂 Keep it up! This is such a great post and so true. Even though Mondays sound so great, I try to take the mentality of “Start today. Start now.” It’s hard, but you can always turn the day around, even if you’ve started bad. Love this! too funny. I’m reading this with a leftover bowl of pasta in my hand. hey it’s now tuesday at 12:19am.